You usually don't even notice it, but twelve to twenty times per minute, day after day, you breathe -- thanks to your body's respiratory system. Your lungs expand and contract, supplying life-sustaining oxygen to your body and removing from it, a waste product called carbon dioxide. Breathing starts at the nose and mouth. You inhale air into your nose or mouth, and it travels down the back of your throat and into your windpipe, or trachea. Your trachea then divides into air passages called bronchial tubes. For your lungs to perform their best, these airways need to be open during inhalation and exhalation and free from inflammation or swelling and excess or abnormal amounts of mucus. 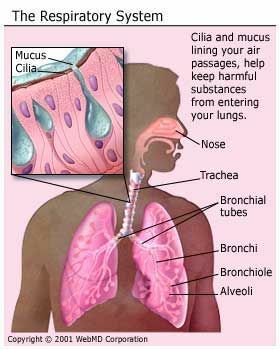 As the bronchial tubes pass through the lungs, they divide into smaller air passages called bronchioles. The bronchioles end in tiny balloon-like air sacs called alveoli. Your body has over 300 million alveoli. The alveoli are surrounded by a mesh of tiny blood vessels called capillaries. 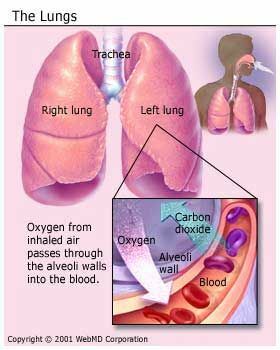 Here, oxygen from the inhaled air passes through the alveoli walls and into the blood. After absorbing oxygen, the blood leaves the lungs and is carried to your heart. Your heart then pumps it through your body to provide oxygen to the cells of your tissues and organs. As the cells use the oxygen, carbon dioxide is produced and absorbed into the blood. Your blood then carries the carbon dioxide back to your lungs, where it is removed from the body when you exhale. Inhalation and exhalation are the processes by which the body brings in oxygen and expels carbon dioxide. The breathing process is aided by a large dome-shaped muscle under the lungs called the diaphragm. When you breathe in, the diaphragm contracts downward, creating a vacuum that causes a rush of fresh air into the lungs. The opposite occurs with exhalation, where the diaphragm relaxes upwards, pushing on the lungs, allowing them to deflate. The respiratory system has built-in methods to prevent harmful substances in the air from entering the lungs. Hairs in your nose help filter out large particles. Microscopic hairs, called cilia, are found along your air passages and move in a sweeping motion to keep the air passages clean. But if harmful substances, such as cigarette smoke, are inhaled, the cilia stop functioning properly, causing health problems like bronchitis. Mucus produced by cells in the trachea and bronchial tubes keeps air passages moist and aids in stopping dust, bacteria and viruses, allergy-causing substances, and other substances from entering the lungs. Impurities that do reach the deeper parts of the lungs can often be moved up via mucous and coughed out or swallowed. TeensHealth: "Lungs and Respiratory System." American Lung Association: "Learn About Your Respiratory System." American Medical Association: "Respiratory System: Basic Function." My Lung Is Injured – Can I Still Breathe?